But I know . . . 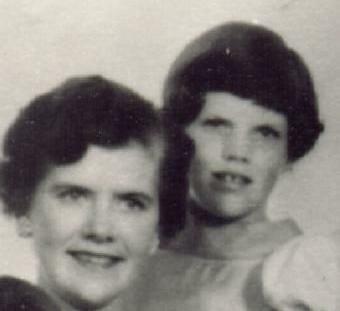 I realize that most of you who read this column did not know my sister, Patricia. But I also realize that most, if not all of you, have probably lost someone you loved. For this reason, I hope there is no need for me to apologize for writing about my sister’s life and death one more time in my Reflections column. My manuscript editor, Barbara Lerma, said that it sounded like Patricia had the “ideal life and the ideal death.” To be vacationing in Mexico, splashing in the water, and feeling like a kid again, right up to your last moment, is a pretty good way to leave this world. Not to mention that she didn’t have to suffer. And the day before she had taken that picture of a sunset which she titled, “What I came for.” Yes, there is some comfort in the knowledge that Patricia was doing what she loved, with the people she loved, right up until the last second of her life. Of course the pain of losing her and the loss felt by those left behind, is still ever-present. 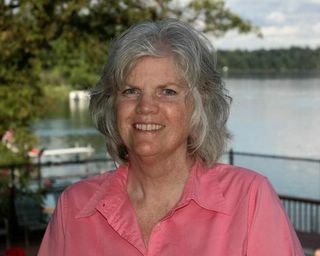 This Saturday, April 23rd, marks one month since our Patricia passed away. It is also the day that Patricia’s partner, Nikki, will be hosting a Celebration of Life service in Patricia’s honor. The ceremony will be held on Whidbey Island in Freeland, Washington, where Patricia and Nikki shared a home. Friends and family from as far away as Alaska, Arizona, Tennessee, Minnesota, Nevada and Iowa will be there. I had always wanted to visit Patricia and see the home she loved so much on the island where she enjoyed the beauty of nature. 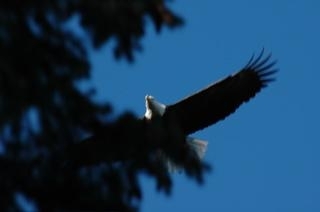 The last pictures she shared with the family (via email) were some amazing photos of bald eagles which she took during a walk on the island. You see, Patricia was someone who not only stopped to smell the roses; she took pictures of them, too. It’s kind of sad that I am finally making that trip after she’s gone, yet I feel the need to connect with Patricia’s world; to see where she lived, walk where she walked, and meet the members of her extended family who loved her so much. I sincerely hope that it will help with the healing and perhaps bring some closure – if there is such a thing. The first poem I‘d like to share this week is one that my sister Mary came across and was printed in the program for Patricia’s funeral. I’ve been feeling so sad about losing Patricia and having to adjust to being a family of eight instead of nine. How can we stay together when one of us is gone? Then my sister Connie reminded me that we’re still nine; it’s just that one of us has gone on ahead. One day we will all be reunited again, but for now, those of us who remain will try to honor Patricia’s memory by living our life to the fullest, the way she did, and the way she would want us to. In addition, we can rejoice that our precious mother and sister are together again – dancing with the angels on those streets of gold. This next poem was written on the way to Patricia’s funeral Mass in Minnesota; I later read it as part of the eulogy. I’ve gone where I most long to be. I said I miss ‘em, but I’m doin all right. I’d like to begin by thanking everyone who sent cards, letters, emails and even flowers – all expressions of sympathy to me and my family after the unexpected death of my sister, Patricia. Every word, thought and prayer has touched my heart. Thank you so much for letting me know that you cared. This week I’d like to share some of “Patricia’s story” with you, as told through the words of those who knew her best and loved her most. She hated to be in front of the camera. She wanted to be behind it. She wanted to be snapping pictures of Connor's funny faces. She wanted to catch me with my hand on the back of my swim-suit, after a nose dive onto the sand. She wanted to say "Get closer together! Zach! Lean in!" – as the cousins laughed, and tried to hold photogenic smiles. She wanted to create collages, calendars, greeting cards – each bearing a bit of her heart – a bit of her spirit, joy and passion in each photograph. She wanted to be outside her home, taking the most fantastic pictures of birds, of green fields, of the people she lived for. The people she lived for. . . . It makes my head reel and hurt and my fingers go numb, grabbing tissue after tissue after tissue to soak up tears, to soak up memories, to soak up the muffled sound of my mother saying "...Patricia..." into my dad's shoulder. “We are all crying a lot and laughing a lot and sitting quietly a lot. (It is Semanta Santa weekend, the biggest holiday in Mexico, so we have to wait until Monday to do paperwork.) More friends and family have arrived and are continuing to arrive and I am grateful for that. Our Patricia was so loved! And the outpouring of love has been incredible. Patricia would always be so choosy when she took a picture. She always had to take it from just the right angle so it looked its best. I think she did the same with all of us. She saw us with all our flaws and quirks, strengths and weaknesses, then chose to look at us at just the right angle. Seeing us as special and talented, wonderful and witty in a way no one else could. Fitting, I guess, because it will come up again to start a new day. We will miss her beyond what words can say. However, I believe her spirit is now with us all, and we will never truly be without her. I think Josh Groban’s song, You Raise Me Up,” says it very well: “I am strong when I am on your shoulders; “You raise me up to more than I can be.” Patricia has raised us up, all of us. I hope and pray that Patricia will experience in eternal life what she has shared with us in her earthly life: God’s great strength, eternal peace, and immense joy. On March 23, 2005, my life changed forever. I was working on book revisions at our house in Manhattan when I heard the doorbell ring. “I’ll ignore it,” I thought. Then I heard knocking on the back door. Perhaps it was our next door neighbor. “Who is it?” I asked. The voice on the other side of the door answered: “It’s Keen.” I wondered what he was doing in Manhattan when I had just talked to him on the phone two hours earlier. When I opened the door I saw a look on his face that I hope to never see again. Following right behind Keen was our son Kirk and his friend, Sam, wearing the same somber look on their faces. My mind began racing through all the dreaded possibilities as I struggled to imagine what horrible thing happened that they had to tell me face-to-face. The awful news was more than I could bear to hear, comprehend, process or accept. I sobbed. Keen hugged me. I hugged Kirk. After the initial shock wore off, Keen helped me gather up my things so he could drive me home and Kirk and Sam drove the other car back to Alma. As anyone who has ever lost a loved one knows, the grief is unbearable – whether the death is sudden, like Patricia’s, or the result of a prolonged illness, like my mother’s. Either way, you never really “get over” the void left by their absence. Our family will never be the same. Patricia and her partner, Nikki, along with several other friends, were vacationing at the Pueblo Bonito Resort in Mazatlan, Mexico, when Patricia was stricken with what we now know was a brain aneurism. She had been complaining of headaches for several weeks, but apparently her doctor didn’t think there was any cause for concern. Patricia was an avid photographer who especially enjoyed capturing the beauty of nature. 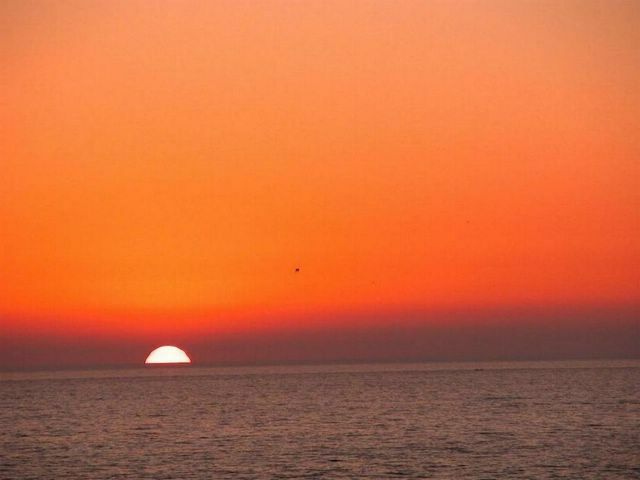 The night before she died, Patricia took the most beautiful picture of the sunset over Mazatlan, which she later downloaded to her computer and titled, “What I came for.” That night, she and Nikki and all their friends sat around and talked and laughed for two solid hours. Afterwards, the conversation turned more reflective and several people around the table told Patricia how much she meant to them and what a difference she had made in their life. Then Connie played the most beautiful, comforting song for me over the phone. The song is titled, “With Hope.” It was written and recorded by Steven Curtis Chapman. On Tuesday, Keen and our loyal employee, Jimmy Hinck, began the difficult task of picking up the towns of Harveyville and Eskridge in our small truck. This involved multiple trips back and forth to the landfill in Alma. Afterwards, Keen and Jimmy decided to go to Flint Hills Foods to borrow a hoist so that they could remove the old engine from big truck for repairs. Well, there was a tragic accident. Keen was pulling the engine hoist on a trailer behind his pickup truck and Jimmy was walking alongside of the trailer to keep the hoist steady, when all of a sudden the hoist fell over, pinning Jimmy to the ground and breaking his back! Jimmy is going to have surgery on Monday. Keen is praying so hard for him. When he called and heard Jimmy’s weak voice, he cried. He feels terrible. He keeps seeing Jimmy’s face and it’s just tearing him up inside. Jimmy has been one of our best employees ever. He is so dependable and enthusiastic. He actually does cartwheels between stops. He’s always talking about how fun his job is and how much he enjoys working for Keen. We are just devastated that this has happened to him. Thank the Lord that we have worker’s compensation so Jimmy will receive a portion of what he normally gets paid from us and all of his medical expenses will be covered. He also works part time for Flint Hills Foods and they have a disability policy that will pay him $100 a month. It’s not much, but it helps. It’s just so tragic. 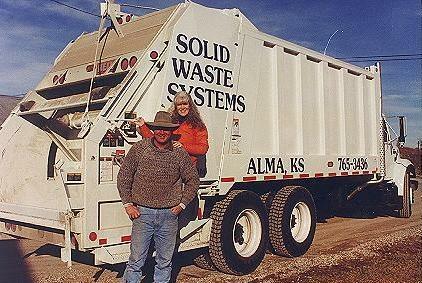 So on Tuesday after he got all of Eskridge and Harveyville picked up, he was headed for Alta Vista when he stopped on the road to pick up a customer’s trash. Just then Norma Conrad was driving by, so she pulled over to see if Keen was having trouble. She told him she was sorry about Jimmy and the truck. “Just remember that things are going to get better,” she said. Somehow those words of encouragement really boosted Keen’s spirits. Just the night before in the trash truck, Keen and I both agreed that despite the chaos and panic all around us, we both had this underlying peace that everything was going to be okay. It was a weird sensation – sort of like looking at the waves and the storm and just knowing that somehow you were going to make it through. We just found out that our new truck is an automatic, so that means I could drive on residential days, [Tuesdays and Wednesdays], and Keen could throw the trash. Since Jimmy is in the hospital, we need a new driver. Plus, this would be another way to save money and make it easier to make our loan payment to the bank. God had that truck all picked out and prepared for us. When I read that note I cried like a baby. It touched my heart so much that we had a friend who was willing to help us in our time of need. When Keen called him back, Mark told him that they so appreciated the way we made them feel welcome in this community. Now he wanted to do something for us. I just felt so touched. We don’t have many friends, but the ones we do have are more precious than gold. It turned out to be a real gift from God to have Mark help, because if he hadn’t gone, then I was going to drive for Keen. So this way I was able to stay home and work on securing the financing we needed for our truck. I ended up being on the phone all day. Then the sooner we got it approved, the sooner Armor Equipment would put men on it nearly round the clock so it could be ready for us to pick up by Friday. To pick up where I left off – we had applied for a loan at the Alta Vista State Bank and they approved our loan at 8% interest! This is the bank that has loaned us the money we’ve needed for everything we’ve ever done as far as business goes. So the wheels were really turning now. Keen and I were so excited with the truck – it was a gift from God. Everything was new and it all worked right. I drove it for two hours just to get my feet wet and did pretty well. We talked all the way back from St. Louis and marveled at how God worked everything out for us. Oh, to have a working truck! It’s all so amazing. We are in awe. Tomorrow will be my first day on the job. Keen said, “The idea of going to work with my wife is so intriguing to me. I can talk to you on the route now, instead of these other guys. I mean, we got married because we love each other. All we’ve ever wanted was just to be together and now we can!” He likes the idea of having coffee with me in the morning while the truck is warming up. He’s really excited. Of course, I’m a little less excited; I guess you could say I’m apprehensive. When I was driving the truck home from St. Louis he said, “I’m proud to be able to show the world that my wife is multi-talented. She can be a Memphis belle when she wants to be; she’s an accountant, a lawyer, a mother, a housewife and now she’s a truck driver.” He’s so sweet and he makes me feel so loved. He also gives me the confidence to believe that I can do anything. So even though last week was probably the darkest and bleakest week of our life, the end result was the purchase of this truck that will make our life so much more efficient in the long run. God knew we needed it and He also knew we wouldn’t have purchased it unless our old truck had a total breakdown. Since we seem to barely make it financially as it is, we never would have willingly taken on the added responsibility of a large truck payment. In a way, I guess we were forced into this purchase, but now we’re glad we were. So I conclude that many times life’s greatest joys are born from life’s greatest agonies. That’s why we should never give up. It’s like Job – he never quit believing in the goodness of God and in the end, God showed Job he was right. God will never, ever fail His children – no matter how bleak things may look at times.